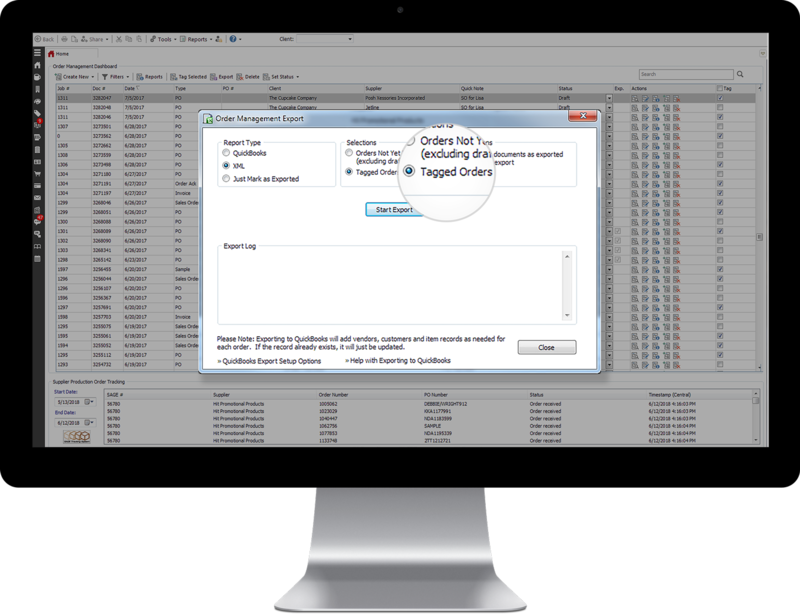 Here is our step-by-step guide on how to use the SAGE Order Management module to streamline your orders and improve your sales process. Log into your SAGE Online account. 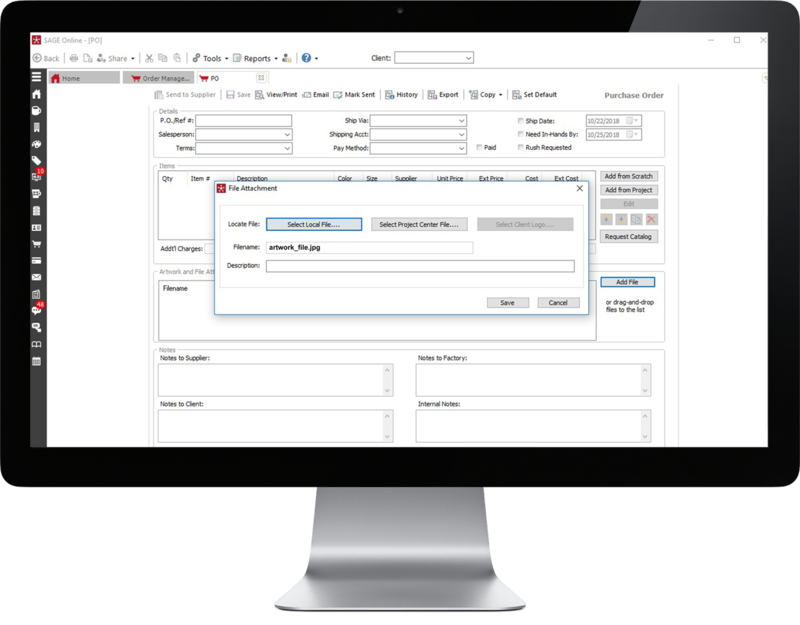 Order Management is also available in SAGE Web and SAGE Mobile. Click “Order Management” in the left menu. Under “Client,” click the drop-down menu next to client field and choose the client from your CRM. Notice how the client information automatically populates into the Bill To and Ship To information. You can add additional details like reference number, terms, shipping account, etc. When creating clients forms, information like terms, shipping accounts, etc. 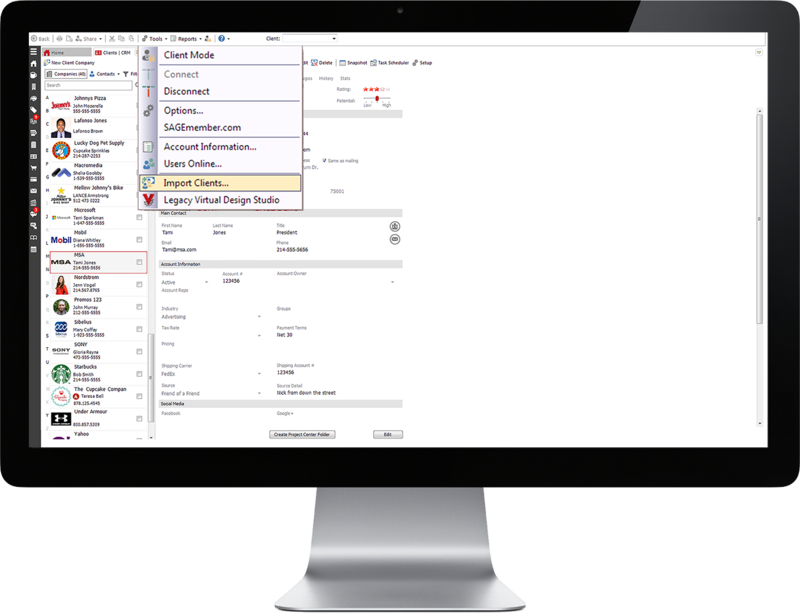 can also pull from client CRM profiles. When converting to a purchase order, if you have a main contact listed and/or payment terms listed under the supplier’s profile, it will automatically add that information to the corresponding fields. 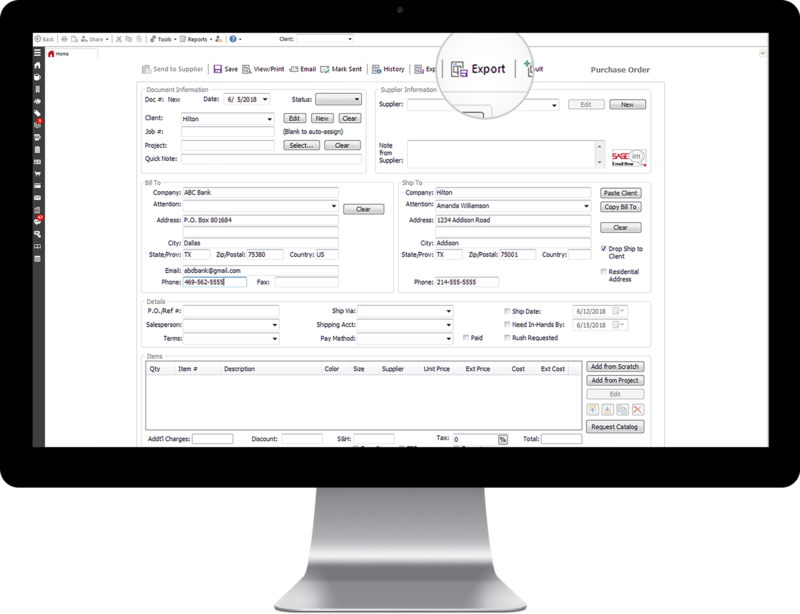 Note, if you have products from multiple suppliers and/or decorators, a separate PO for each will be created automatically. 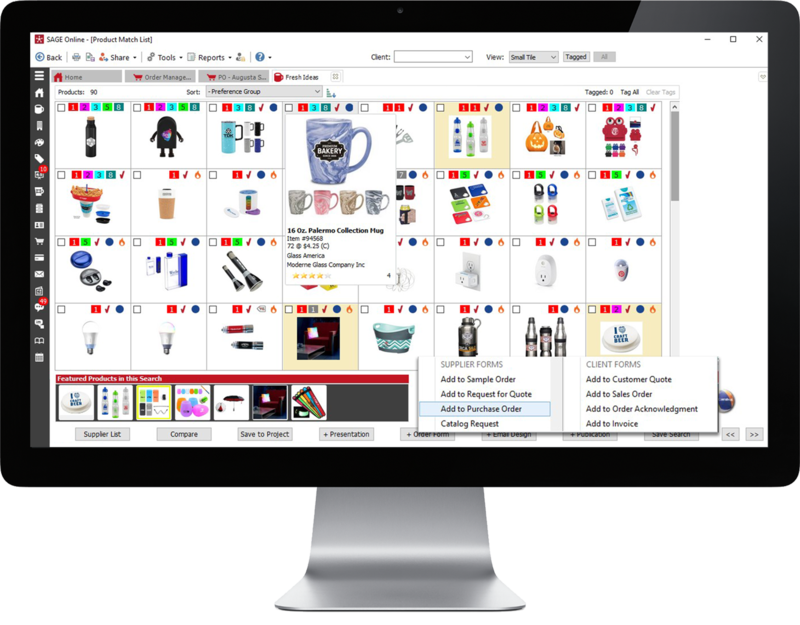 After adding a product, you can select a quantity, adjust colors if needed, select additional charges, add notes, and more. You can also create an order form straight from a product search. After finding a product, simply click on “Actions,” and choose “Add to Order Form.” You can even drag and drop products into a form by dragging the product into the interactive order tab. To include artwork or files, you can either add from the logo bank, “Add Local File” or drag and drop files to the list. Scroll back up to the top to save, view or print, or email your form. 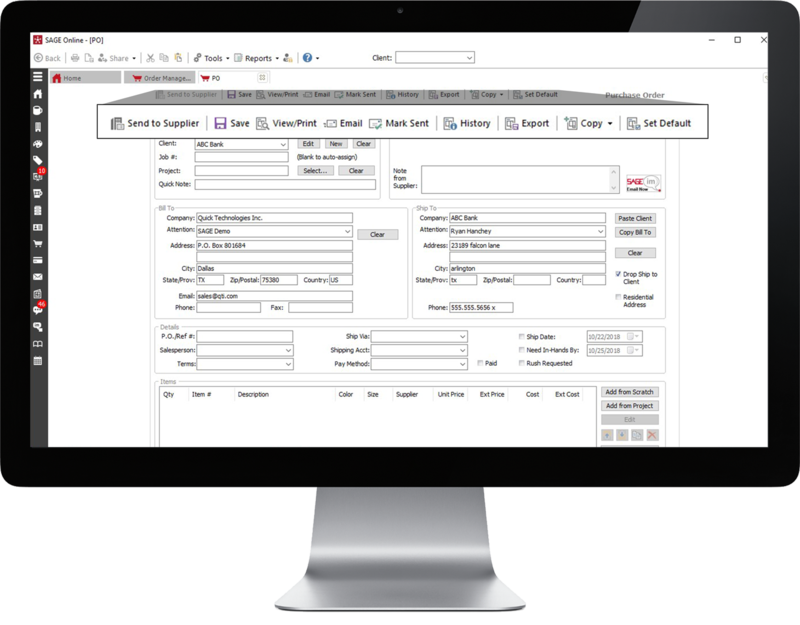 You can send the form directly to the supplier through the SAGE network. You can also track the delivery of the form and know when the supplier looked at it through your history. 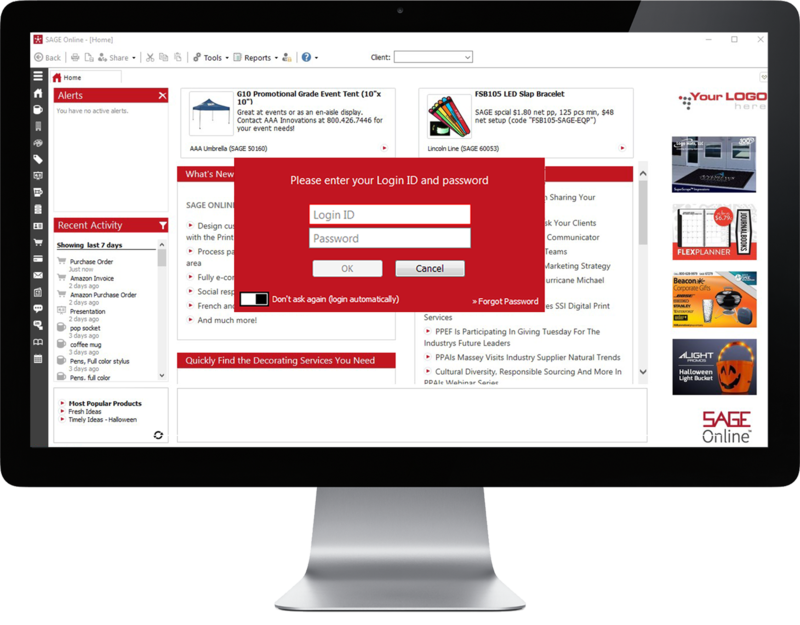 The SAGE system will also send the form the supplier’s preferred email address. To filter your forms, select the “Filters” option at the top of the dashboard. 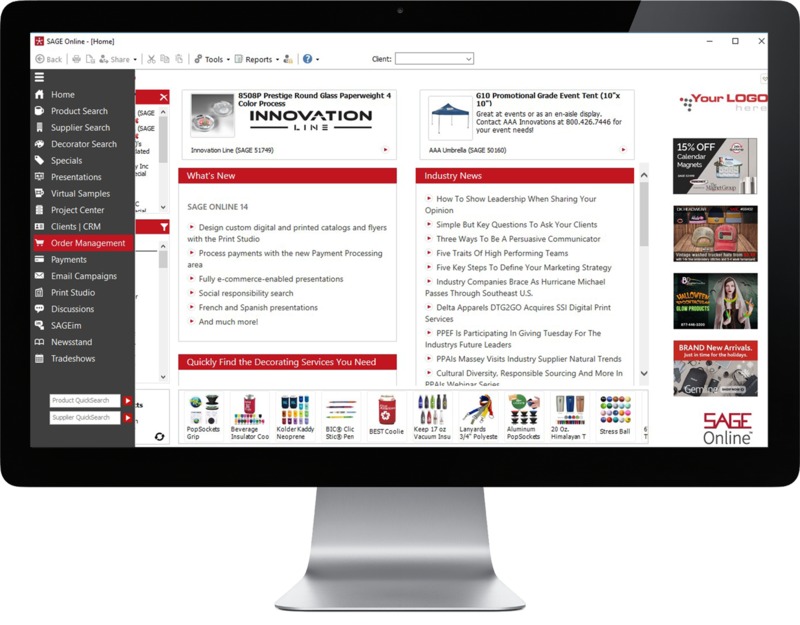 Narrow your search by date range, salesperson, client, supplier, and more. If you would like to export your forms, click the “Exports” button at the top of the dashboard. 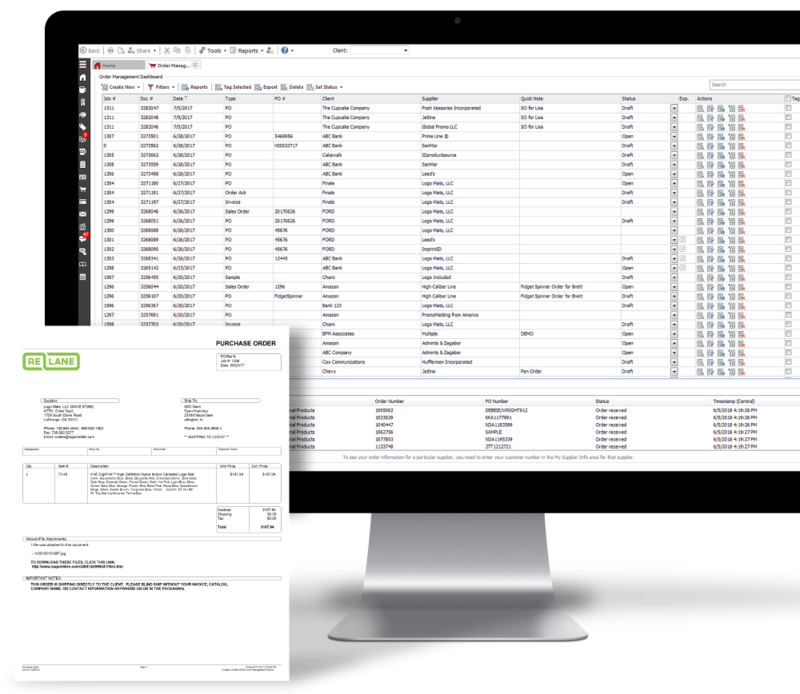 Export as an XML document, integrate your list with QuickBooks Online, or simply mark your list as exported. The Order Management module integrates seamlessly with QuickBooks Desktop and QuickBooks Online. Watch the webinar to see how to integrate your QuickBooks Online system. Click “Reports” at the top of the dashboard. The current dashboard view will create a report from what you have on the order management dashboard. Filter this report by tagging documents in the right-hand column to see a report with only those tagged items. 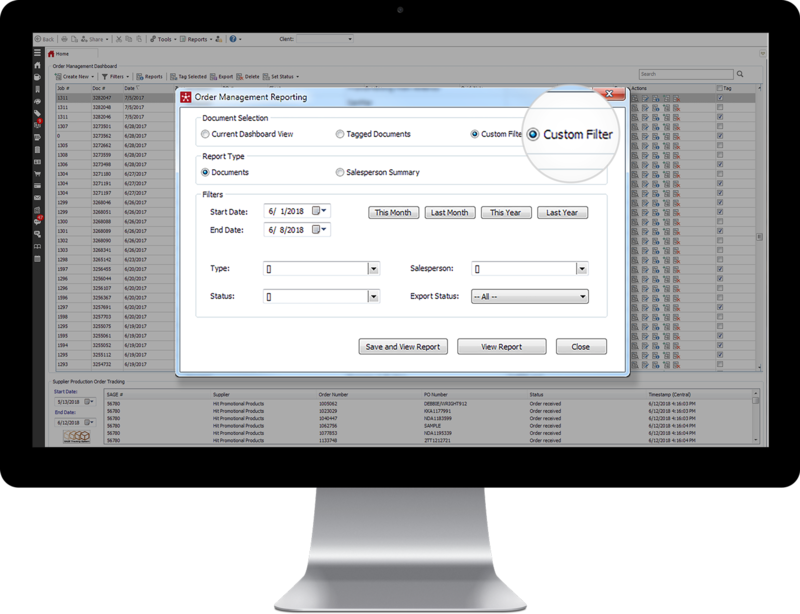 For more specific reports, select “Custom Filter” in the “Reports” tab. When you click “Documents”, this will show you all of the order activity within the dates selected. The salesperson summary breaks down the information by each individual sales rep and shows you their number of transactions, total costs, total sell, total profit and GPM. Select “Type” to see specific reports on orders, quotes, invoices and more, helping you monitor what each rep is spending the majority of their time on and which rep is selling the most. The best part is that you can access the Order Management module and all your data from SAGE Online, SAGE Web, and SAGE Mobile! 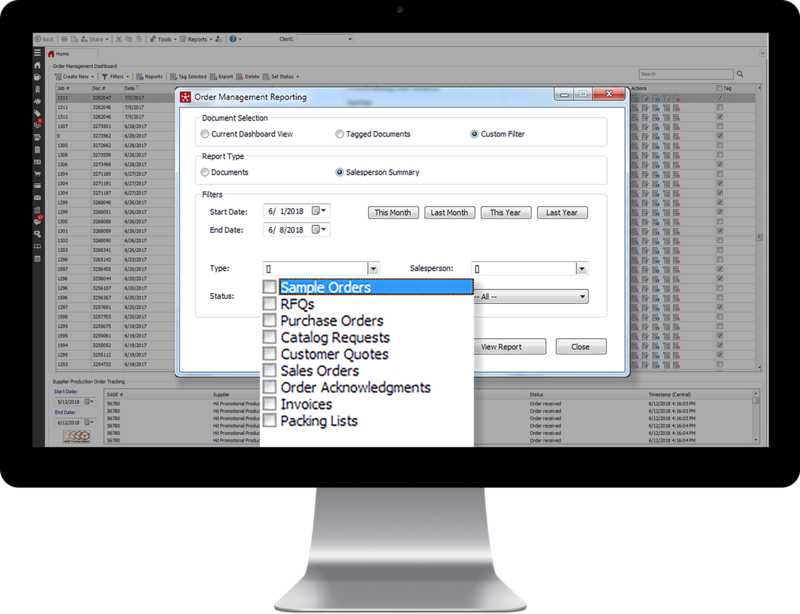 For more details on Order Management, contact your SAGE account executive!